"Get out the vents you damn, newbie engineer"
This map is my favourite. The layout is unbiased, it looks good and contains the most atmospheric sound outside an "Alien" movie. The only gripe I have with this map are the vents. 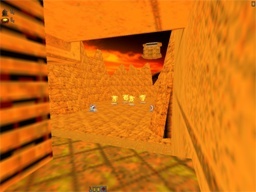 When they where first discovered they were great, they completely turned around the gameplay on this map (at least on barrysworld), but all good things must come to an end and the vents have become an easy way out for the humans. If the spiders get in there (as in the good old days) the game becomes much more interesting but both entrances available to a breeder can be covered from one position by one grunt. I could moan that the spiraling ramps leading down to the lower level are easily camped by anything as large as a drone, and being english I think I will, but also the doorways on the higher level are to the humans advantage so it balances out. If a vent ban is imposed (at the start of the game) this is definately my favourite map to play on. But because the vents where unknown for so long and then suddenly used in abundance all is forgiven. Comment: Good use of the Q2 texures. Not much to say. Comment: Fantastic, The two levels really give this map an exploration feel. Comment: Sounds. The sounds on this map rule. The aforementioned two levels is really good aswell. Comment: ATMOSPHERE, and playable. A great map. This review has been read 1089 times. 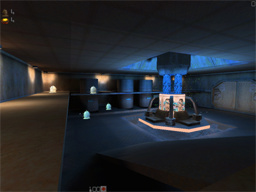 The Gloom Map Depository is copyright Team GMD. Quake2 is a registered trademark of Id Software. Gloom is copyright Team Reaction. The review script is copyright R1CH.